BPSC Civil Services Recruitment 2016 – Apply Online for BPSC 60th-62nd Vacancy 2016: Bihar PSC Civil Services Recruitment 2016 announced. BPSC Civil Services preliminary exam to be held next year in February 2017 through BPSC 60th-62nd Notification Recruitment 2016. 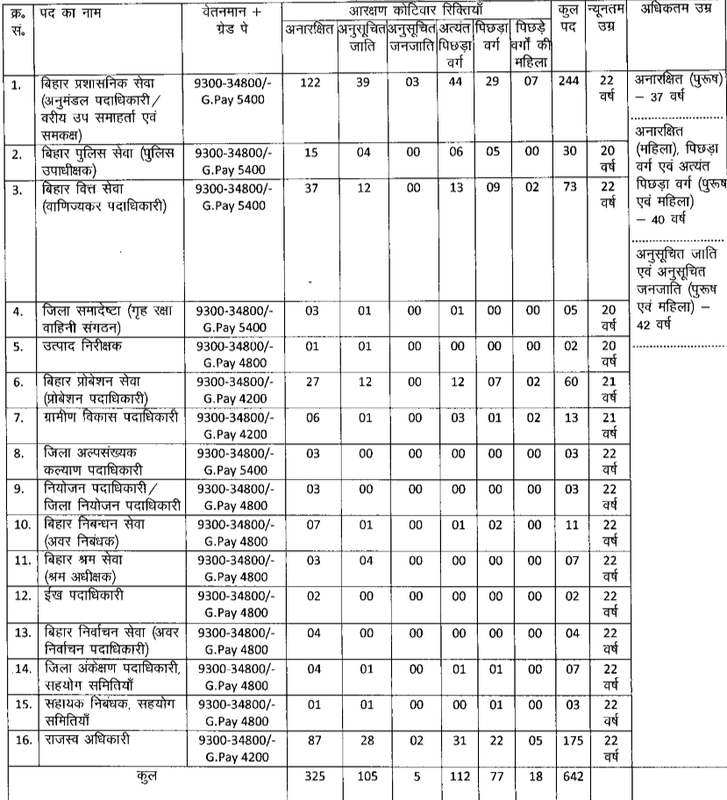 Bihar Public Service Commission (BPSC) has posted an employment notification for conducting Bihar 60th, 61st and 62nd Common Combined (Preliminary/Mains) Competitive Examination 2016. Name of Exam: 60th, 61st and 62nd Common Combined (Preliminary/Mains) Competitive Examination. Age limit: Candidate age should be between 22 years to 37 years. Read details posts on BPSC Civil Services Eligibility Criteria. Age relaxation is applicable as per the Bihar Govt. rules. BPSC Civil Services Eligibility Criteria details. Application Fee: General/ OBC candidates any category candidates of other are required to pay Rs. 650/- as application fee and Rs. 50/- as Bank Charge while SC/ ST category candidates belonging to MP will have to pay Rs. 200/- as application fee and Rs. 50/- as Bank charge. Application fee should be paid in the form of prescribed Bank Challan form available in the website payable at any branch of State Bank of Bank in the Account No: 31650243410. Selection Process: Candidates will be selected on the basis of their performance in BPSC Preliminary Examination, Mains examination and Interview. Pay Scale: Rs. 15,600-39,100/- + Grade Pay 5,400/- and Rs. 9,300-34,800/- + Grade Pay 4,800/- as per the post. Online Application Form: All those candidates who wish to apply for BPSC 60th-62nd Recruitment for Bihar Civil Services Competitive Examination, they are required to apply through online mode by filling online application on its official website at www.bpsc.bih.nic.in on from 27th September to 31st October 2016. Visit official website at www.bpsc.bih.nic.in. Click on “60th, 61st and 62nd Common Combined Preliminary Competitive Examination -2016” link. More Details: Candidates are advised to read official BPSC 60th-62nd Civil Services Exam notification for detailed information about BPSC Recruitment for Bihar Civil Services regarding age limit, educational qualifications, last date, pay scale, how to apply and online application form. Download BPSC Civil Services Notification.